WE NOW SHIP NATION WIDE! Our bread and bagels are baked fresh every morning in our own dedicated, gluten-free bakery and are nutritional powerhouses filled with protein, fiber, and flavor. We like to consider our products as the natural evolution of bread and bagels. All of our ingredients are locally sourced from Northern California farms and small businesses. Mina, one of our co-founders, used to weigh 400 pounds before he successfully lost half his body weight using only diet and exercise. Throughout his 4 year weight loss journey, Mina leveraged his knack for experimentation to develop healthy and delicious alternatives to some of his favorite baked goods. As a nurse, Kim learned that it's much better to practice preventative care than to treat a condition that has already developed. Her experiences treating patients and in her own life have taught her that one of the most effective ways to stay healthy is to eat a nutritious diet. In 2014, Kim and Mina met and bonded over their passion for healthy living, exercise, and delicious baked goods. Both were dismayed by the lack of good nutritional value as well as the severe lack in taste in all the commercially available "healthy" alternatives. So they set out to make their own, and Ducks and Dragons took flight. Why the name “Ducks & Dragons”? We believe that baking is a labor of love. Our name is a nod to two phenomenal and amazing women, upon whose love and continued support Ducks & Dragons Bakery was founded. Our location is for wholesale, and preorder pickup only. Place your order by Monday at noon and we'll ship it using USPS 2 Day Shipping on Tuesday morning. Pickups at the bakery are available on Mondays, Tuesdays and Thursdays between 3pm and 6:30pm. Please place your order no later than noon the day before and we'll have your goodies freshly baked and ready to go. All orders placed from our online store will be available for pickup during market hours below. For pickup during the College of San Mateo Farmers Market (Saturday 9 am-1 pm) place order NO LATER than Friday 12 PM. For pickup during the Palo Alto Farmers' Market (Sunday 9 am-1 pm) place order NO LATER than Saturday 12 PM. Come visit our booth at the farmers' market. You will find our delicious baked goods freshly-baked that morning! We offer unique items at the farmer's market that are not available at our other retail locations. For example, limited edition flavors, like blueberry-cinnamon rolls, and seasonal items, like pumpkin bread are currently only available from our market booth. Other "market-only" items include our delicious, par-baked pizza crusts and sandwich loaves. So it's definitely worth making a trip to visit us at CSM! JWeekly: Hardly Strictly Bagels (February 2016) How About Some Sunrise Bagels As I Ride Off into the Sunset? • What’s in your breads and bagels, if there’s no flour? All of our baked goods are made of a blend of fine ground almonds and coconuts. This means that our breads and bagels are nutritional powerhouses that are naturally full of both protein and fiber. Additionally, our baked goods contain eggs, tapioca flour, arrowroot flour, honey, flaxseed meal, yeast, coconut sugar, psyllium husks, xanthan gum, and salt. For a complete list of ingredients, click on individual products in our store menu. All of our baked goods contain both tree nuts and eggs. 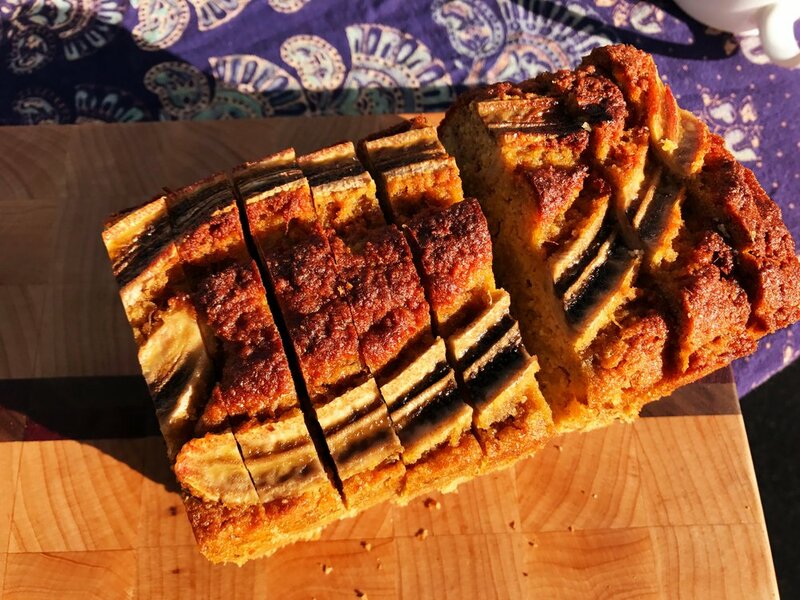 Our breads and bagels are paleo-friendly and perfect for those who are trying to adhere to a gluten free lifestyle, or anyone who is trying to eat healthier foods in general! • What’s NOT in your breads and bagels? All of our baked goods are gluten-free, grain-free, soy-free, corn-free, dairy-free**, and contain no GMO’s. We never use preservatives. Additionally, we bake all of our products in our own, dedicated, gluten-free facility. **With the exception of our cheddar roll, which contains milk. • How long will the breads and bagels last? Our baked goods will stay moist for up to 2 days at room temperature; but to keep them at their freshest, we recommend sealing our breads in a plastic freezer bag and freezing them until ready to eat. 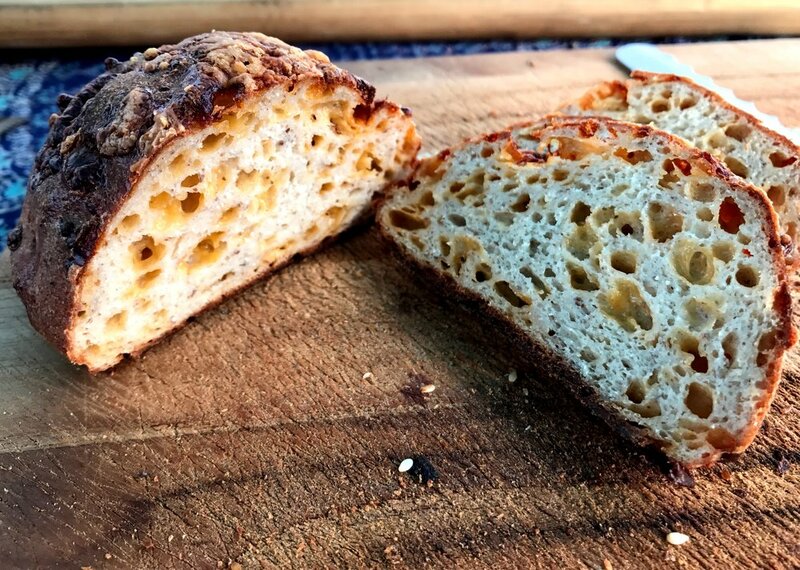 We've frozen our breads up to 6 weeks, and they've maintained their freshness perfectly! • Can the breads and bagels be refrigerated? We recommend freezing our baked goods, if you’re not going to enjoy them within the next day. • How well do the breads and bagels freeze? Our breads and bagels freeze exceptionally well, and they taste great once brought to room temperature. We’ve frozen our products up to 6 weeks, and they’ve maintained their freshness perfectly. • Do you bake in a dedicated, gluten-free facility? Yes, we bake all of our products in our own, dedicated, gluten-free facility in San Carlos. • Where can I buy your breads and bagels? Do you have a store? You can also visit us at the College of San Mateo farmer’s market on Saturday mornings from 9:00 am to 1:00 pm and at the Palo Alto farmer’s market on Sundays from 9:00 am to 1:00 pm. You can place an order on our website: www.ducksanddragons.com and pick it up at the farmer's market or at the bakery. Currently, we offer pickups of online orders at our bakery on Monday, Tuesday and Thursday between 3:00 PM -6:30 PM. We love getting to know our customers at the market! We also offer special items at the farmer's market that are not available at our other retail locations...more reason to come by and visit us at the farmer's market!! • Do you ship your baked goods? Yes, we now offer shipping nationwide for a flat rate of $20. Orders placed by Monday at 12 PM, will ship out Tuesday morning.